Beto, (Bet-oh) was challenging Ted Cruz for a senate seat held by Republicans since the early nineties. Cruz was considered a lock at the time, and Texas opinion writers gave Beto no chance. Texas was flat out red. Then came a turning point. At an August Town Hall meeting Beto took a question from someone offended that NFL players could kneel during the anthem. Wasn’t this an insult to the brave men and women in the military? Beto paused, said the short answer was no, then gave a longer one, relating the protest to those who sacrificed life and limb during the civil rights movement, to the killing of blacks by police, to the blood spilled by black and white alike in “places like Omaha Beach.” Beto ended his answer with the phrase, “I can think of nothing more American.” The applause began before he finished the sentence. The crowd was with him, many stunned by his combination of logic and passion. The NFL answer lit up the internet and spread to cable news. Beto was soon on the national stage, Colbert, Bill Maher, Ellen DeGeneris and others. Some were calling him the next RFK, and he had the look, a slightly goofy smile, a little funky, a little elegant. Cruz would seize on Beto’s words to repeat his theme that Beto was out of step with Texas values. 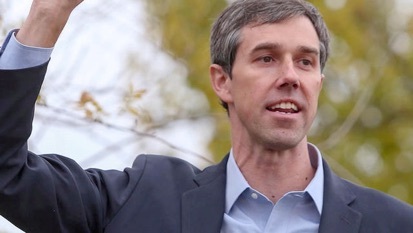 Anti-Trumpers and a growing Texas demographic including women, younger voters, and people of color were taken by this onetime punk rocker who relaxed by skate boarding in Whataburger parking lots – duly recorded in social media, in which Beto dominates. He’s posted almost every minute of his campaign Odyssey for all to share. As for Texas values, Beto pointed out in the first debate with Cruz that he’d visited every one of the state’s two hundred and fifty-four counties. Behind the wheel of a pickup truck or a Dodge van he’s been to the reddest. In comparison he said that soon after Cruz was elected, he visited not only New Hampshire and South Carolina, but all ninety-nine counties in Iowa. According to Beto, Cruz missed one half of his Senate votes in 2016. For Cruz there’s also the well known unlikeability factor. Along with other expletives John Boehner called him “Lucifer in the Flesh.” A colleague famously said that if somebody shot him on the Senate floor nobody would do anything about it. Suppose Beto wins and helps flip the Senate? Beto takes no pac money. He’s online asking for three dollars and up. He’s outraised Cruz and the right wing mega-donors. By the end of the campaign he may have twice as much in reserve as Cruz. He’s even been criticized by some Democrats for not sharing it. The response is that his campaign needs every penny. There’s a place on his web site for for volunteers to sign up. It lists jobs from data entry to phone banking, from canvassing to something called a ‘social media rapid response team.’ The last category is ‘other.’ I click on that. A few e mails later I’m on the phone with a Beto rep. I tell him a little about myself, writer, teacher, open to anything, and above all, how I can do this on my own dime. A map is emailed. Beto has fifty-four campaign headquarters throughout the state, in places like Odessa, Lubbock, Dallas, Fort Worth, Corpus Christi, El Paso. I retrieve the road Atlas from the back seat of of my Saab. Texas takes up twelve pages. Dallas is a one stop flight. Now I monitor the Beto news. There’s Beto at one of his three hundred plus town hall meetings, holding the mike with his sleeves rolled up and sweating through his shirt. He gestures with his free hand, reaching out to pull in the audience. He talks health care, education, immigration, the liberal playbook, but with this difference: how Texans can lead the way on these issues. Texans with their low voter turnout record, Texans needing health care and affordable prescriptions, Texans whose opioid treatment center is often the county jail. He’s captivating, smooth and rough at the same time, a toothy grin out of Mark Twain, all Texan, all American. Willie Nelson hosts a rally and concert, Beto joins him on the stage. Willie writes a song for the occasion called Vote ’em Out. Cruz is worried. He says the left will crawl over broken glass to vote. He calls on Trump for help, his old nemesis, the man he called a coward and a pathological liar. Through September Cruz is still ahead, in some polls by high single digits, but polls are slippery as live fish. Texas opinion writers say the race will be won by the undecided, who in the end will come out for Cruz. This is Republican muscle memory. This is where I might come in. I’m thinking of ten days in Dallas. Can I work in early October? It’s hot in Dallas. I buy some short sleeved shirts, pack a deodorant stick, a baggie full of almonds. Friends encourage, my wife gives her blessing.